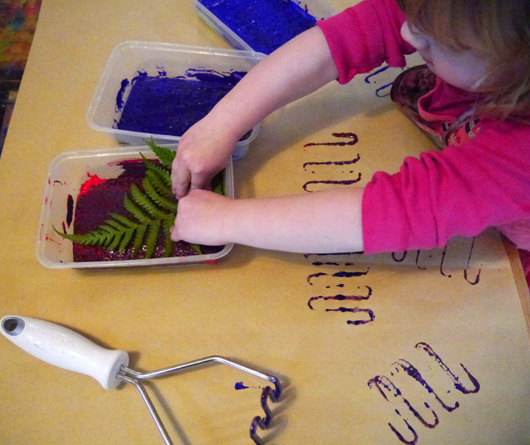 I love a bit of process-based art and so does my 2 year old. Boo is all about the PROCESS.... she cares very little about the product. And now I have in my lap a wonderful book filled with a stack of process art ideas. 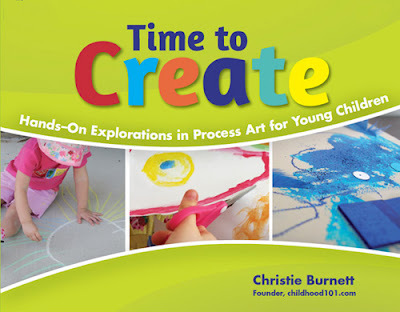 This book is Time to Create, Hand-On Explorations in Process Art for Young Children, written by Christie Burnett. With chapters ranging from drawing to sculpture to digital photography there is something for everyone no matter where your mess tolerance lies! 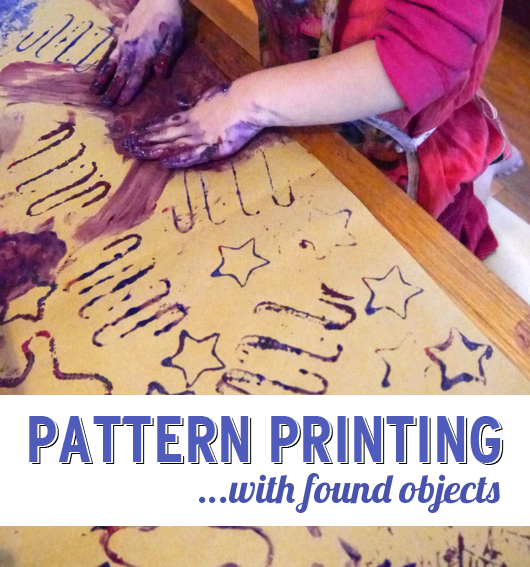 We, of course, picked something a little messy to try out first – pattern printing with found objects. It was great fun..... this is what you need if you want to try it too. Paper – I spread out a large piece of brown paper from a roll that I picked up in the supermarket, but any paper will do the trick. Sponges and takeaway/plastic containers – place one wet sponge into each container. Use one container for each colour. We used three. 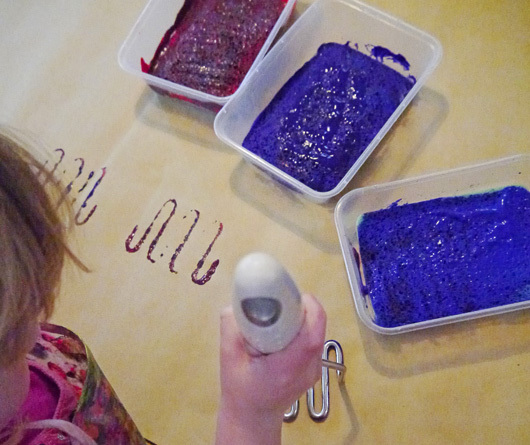 Paint – squeeze a generous dollop of paint on top of the wet sponge. I spread the paint out over the sponge with a paintbrush. 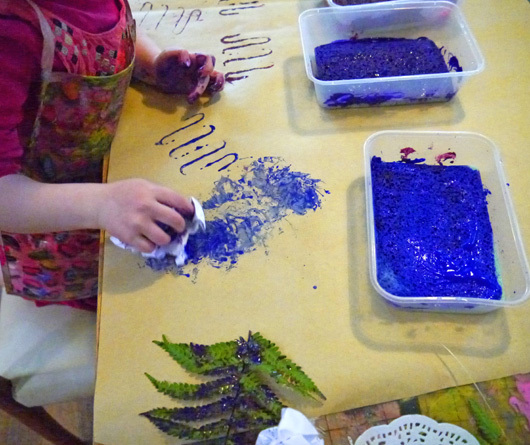 The wet sponge absorbs the paint turning the sponge into one large stamp pad. 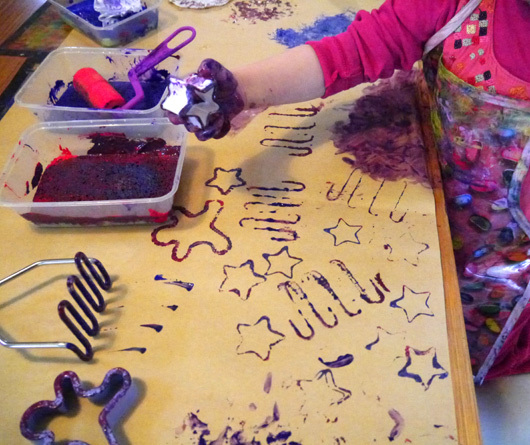 Miscellaneous stuff that you can print patterns with – we used a potato masher, leaves from the garden, cookie cutters, crumpled paper, and Boo also experimented with her fingers and hands..... as a 2 year old will! We turned our pattern print into a piece of wrapping paper for a special friend. This is just one of the many ideas in Time to Create, it is a great resource for encouraging art... even if you don't think you are arty! I love all the cool stuff you found to paint with, and it came out looking awesome too! So much fun...love the prints on the brown paper. Potato mashers are my girls favourite tool at moment! Fab book to! I love your choice of printing objects, Ali! It looks like Boo had so much fun and she is clearly enjoying the process :) Thank you so much for being part of the book tour.